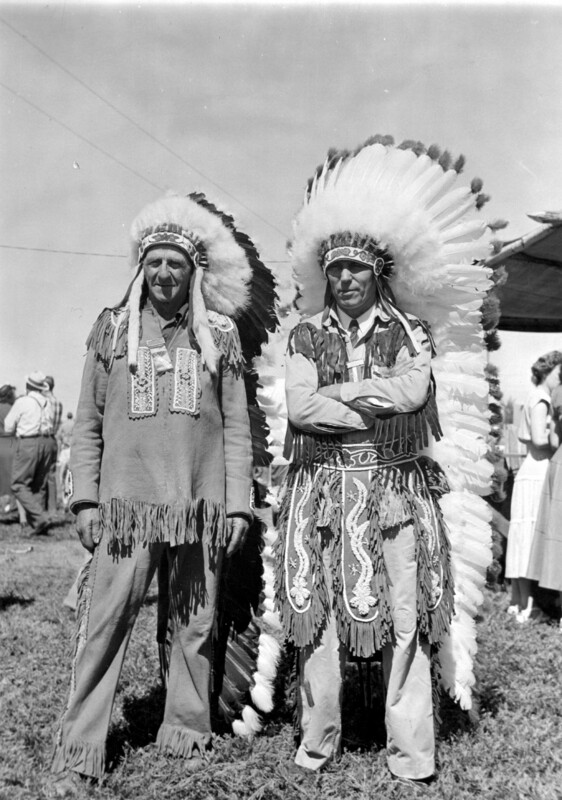 Two men, who don't look particularly Native American, and with very European names, dressed up as Indian Chiefs for the Minnesota Centennial in 1949. From this set. Bemidji, Minnesota: home of Paul Bunyan and Babe the Blue Ox, but the giant pair were still twenty years away when this postcard was mailed in 1916. 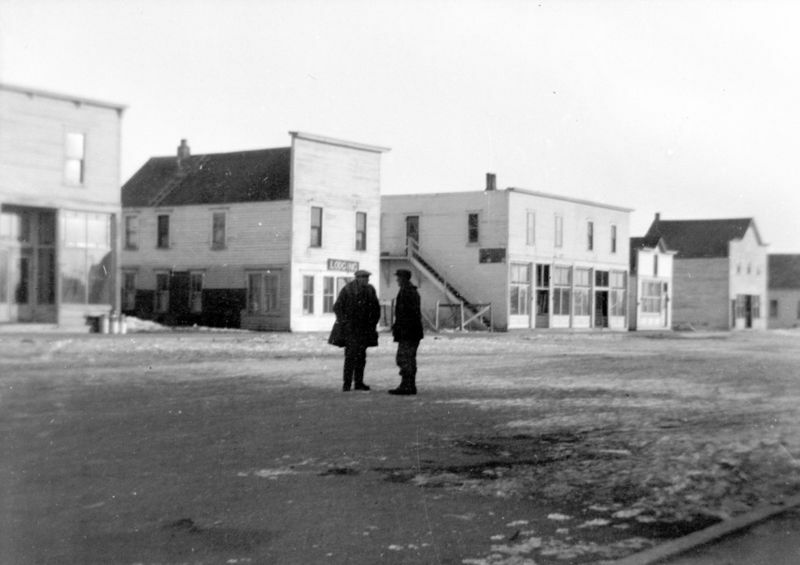 In the 1910s, it was still a community on the grow, trying to develop roads and railroad access. A new depot was built a few years earlier than when this postcard was mailed and railway passengers were probably one of the main customers of such mementos of midwest travels. 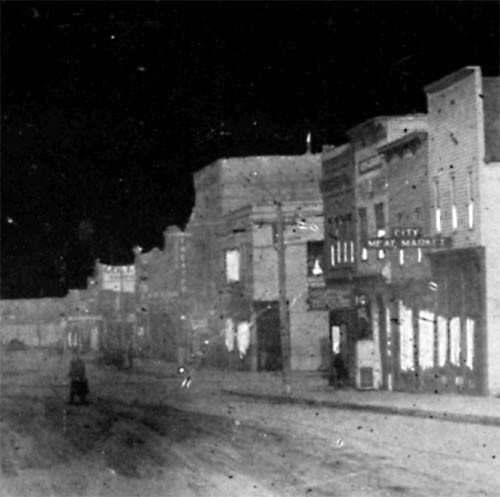 Cameras of the time were not particularly efficient at night, so this photo was probably a daytime photo that was underexposed and colored to make it look like 'night'. 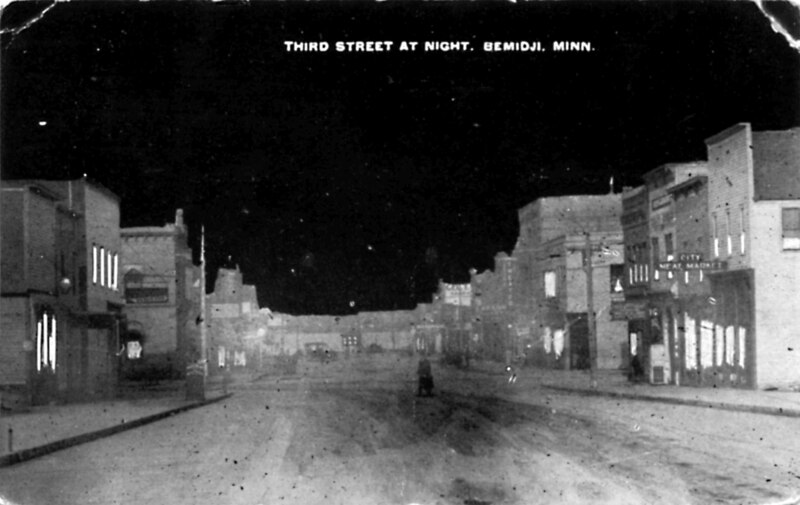 In the 1910s, Either Third street has changed significantly, or the view is from a different spot: Google Maps doesn't help. 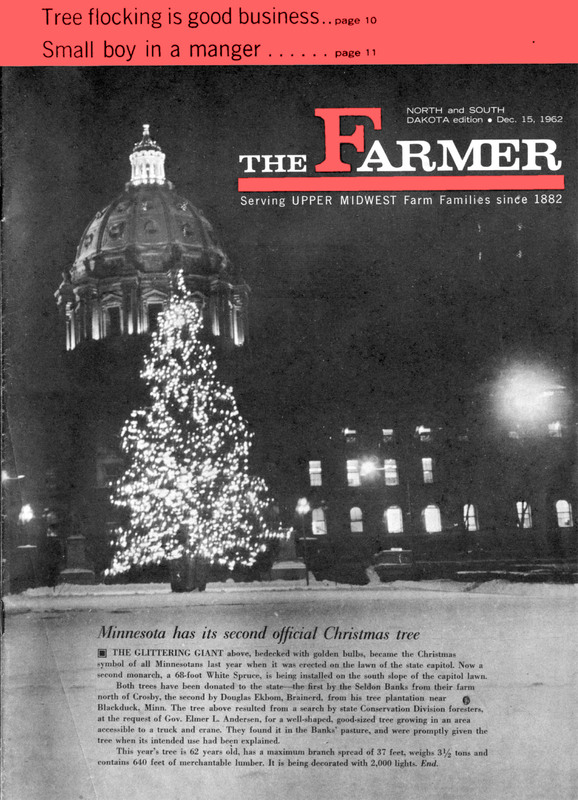 In 1961, new governor Elmer Andersen sent his finest tree-experts to find a grand tree, an amazing tree, a tree that was big and accessible to crane, to place on the State Capital lawn. The tree was found in the pasture of Seldon Banks, who donated it to the state. The image above is of Andersen's first official Minnesota Christmas Tree, from the year before; the misleading caption referring to the "Second tree" in the article is the 1962 tree that was erected before The Farmer could get a photo for their cover. 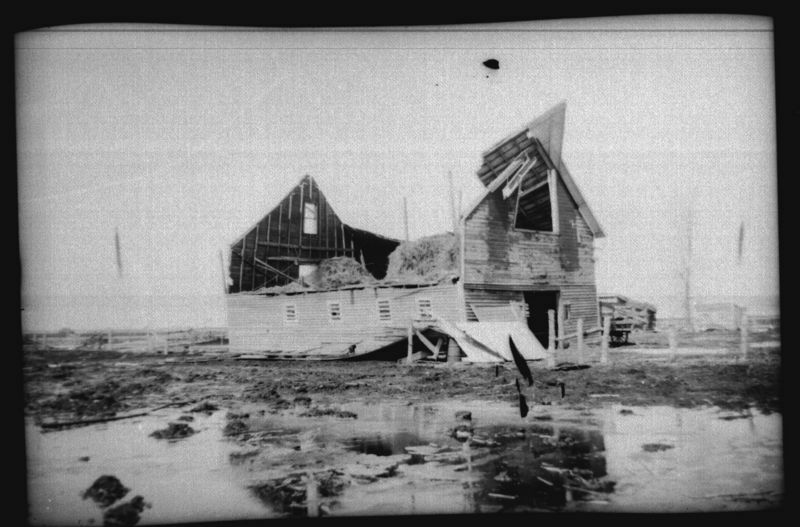 A wind-blown prairie farmstead, circa 1920s. 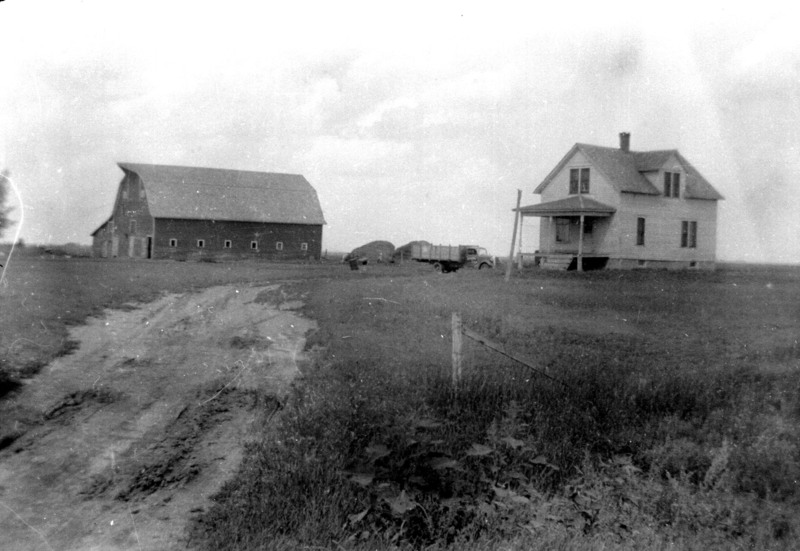 I believe this farmstead was located on the northern end of Clay County, Minnesota, north of Felton. 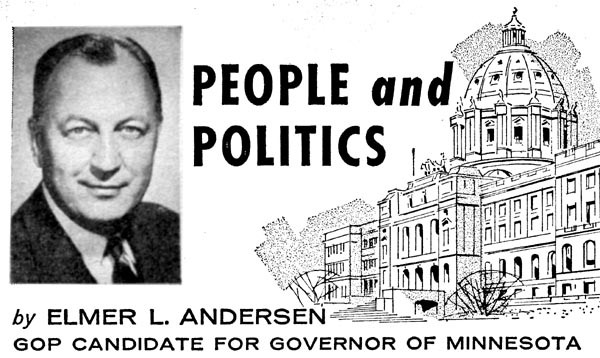 In 1960, Elmer was on the GOP ticket for Governor of the state of Minnesota. A few short weeks after he published this ad in The Farmer magazine, he won his bid, starting a controversy-free term in charge of the state. Two short years later, however, he was undone by 91 voters: in an extremely close election, he lost out to Farm-Labor candidate (and his Lieutenant Governor) Karl Rolvaag. Despite his Republican heart, Andersen was a self-proclaimed liberal to the end, even endorsing John Kerry during the 2004 election. Andersen passed away shortly thereafter. 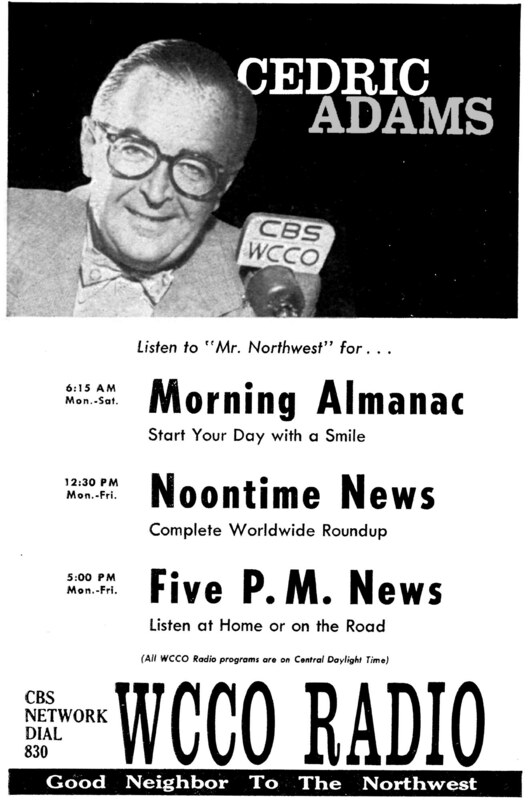 An advertisement from The Farmer, 2 July 1960, for WCCO Broadcaster Cedric Adams. Welcome to Revere, Minnesota. 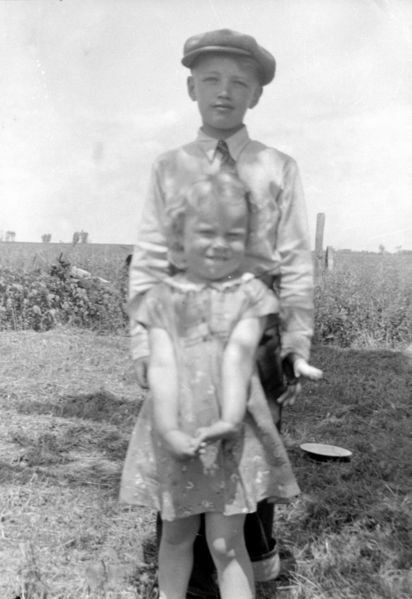 Walnut Grove, where some of the Laura Ingalls Wilder books were set, is the largest town to the west, and Lamberton is the larger town to the east. All these towns are connected by US Highway 14, but the railroad was once the main way to get from here to there. Only a couple miles separate these towns, with Walnut Grove and Lamberton being larger, and Revere becoming a stopping point between the two. 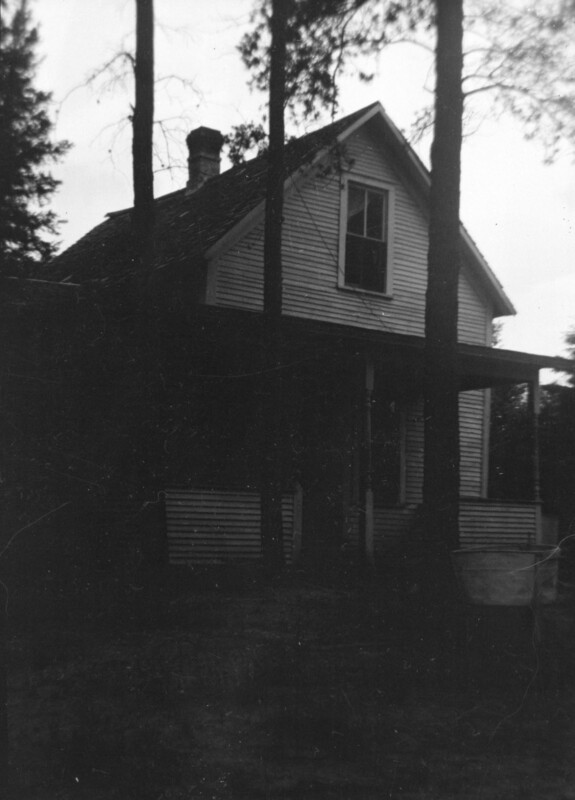 During the early 1920s, however, the family of one of the residents took a bunch of photos. The photos come from the large lot of negatives I purchased last year. The people are in their twenties and thirties in the negatives I've scanned before, and in these photos they seem to be in their teens. I can't quite tell if they were visiting Revere, or if they had lived in Revere during their youth. Anyhow, the photographer in the family took lots of pictures, capturing quite a bit of Revere's downtown area. The 1920s send their wishes you a Happy Easter! 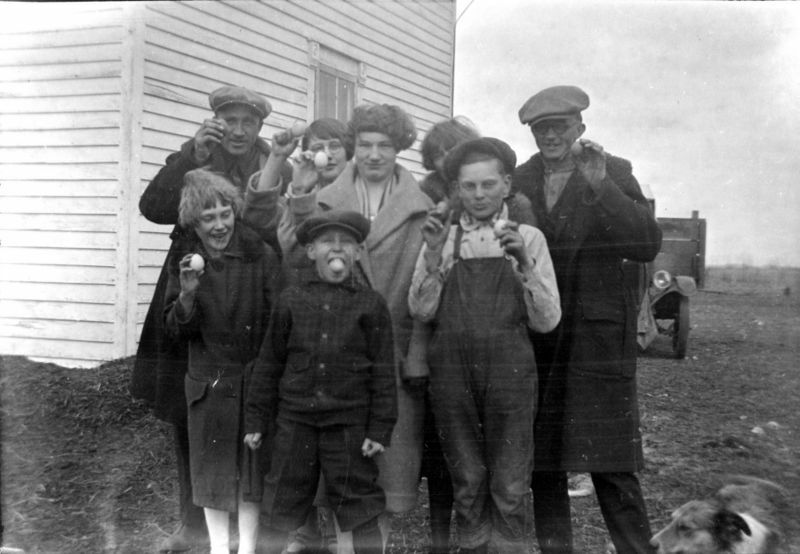 In this photo, younger versions of the people seen in the Minnesota photo negative set show their Easter morning discoveries. I just hope nobody bumps that kid in the middle too hard. 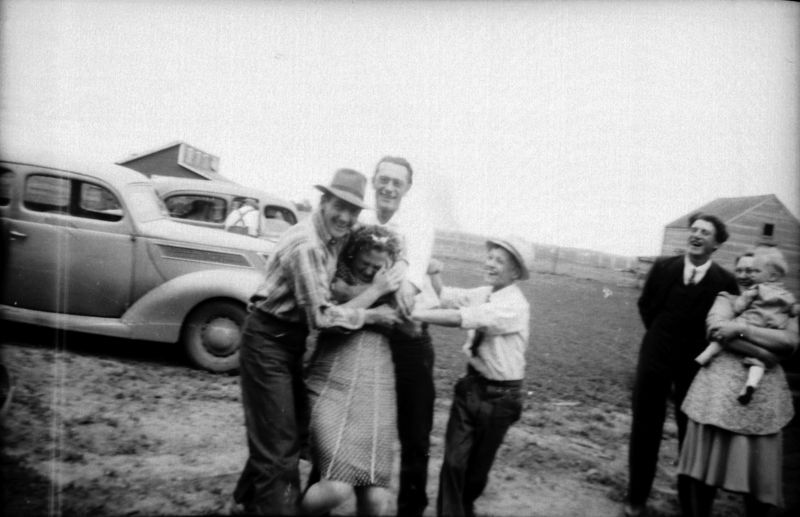 This image was poorly exposed and blurry; I had to squeek out as much as I could using Photoshop -- I'll bet the young lady being tortured in this photo was happy to see that this photo didn't turn out originally...but she had no idea that 70 years later somebody on a computerized internet would blog about it (I'm not sure she could even parse that last phrase.) 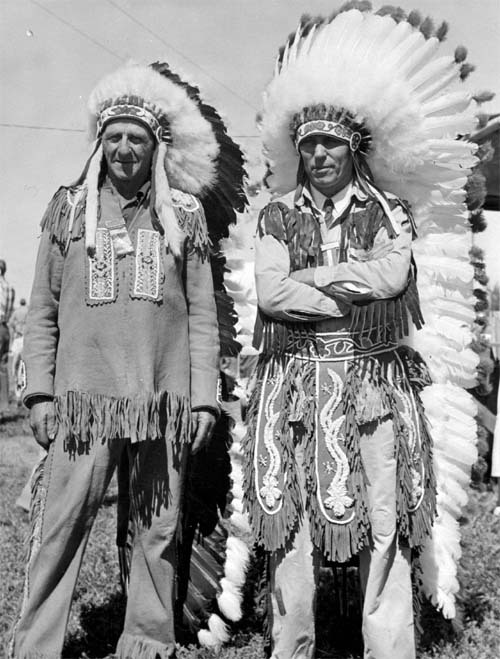 I personally love the unposed, candid photos like this one: look at what has been tossed out because it was unfit for photo albums; today is even worse, when you can completely delete an image, permanently, without thinking twice. People who stick to stiffly posed photos are missing out on the vibrant art that can come from an unplanned, quick and dirty photo. The photo above has so much going on in it -- the wrestling in the foreground, and what are they stealing from her? The friendly grouping on the far right, who look like they might otherwise not be photographed as in that same grouping because there's no logical reason to do so. The guy hunched over in the distance, leaning inside an open car door. When people are posed in a stiff, unlively manner, something is lost -- I'll bet Bertha was a far more fun person than this photo would lead the casual viewer to believe. 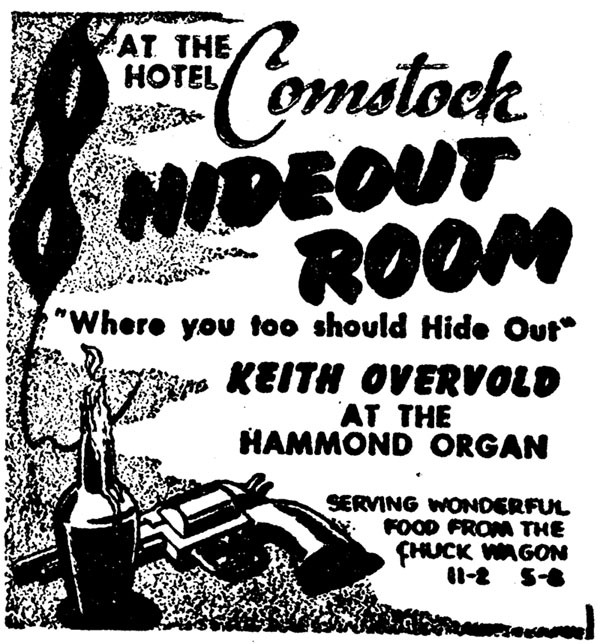 This came from a 1955 Moorhead Daily News, advertising the Comstock Hotel's Hideout Room. This appears to have been the hotel's lounge, featuring the dulcet tones of the Hammond organ. 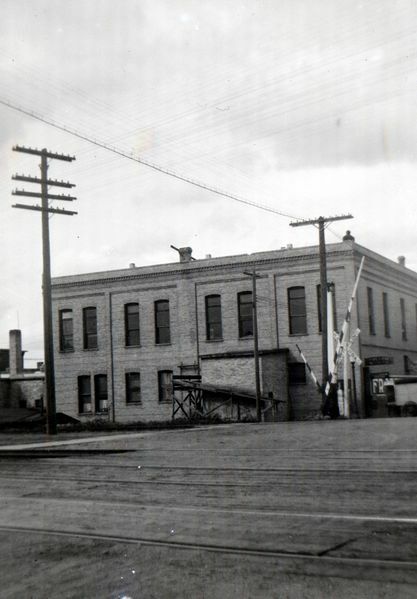 The Comstock was located in downtown Moorhead until Urban Renewal flattened and re-drew the flood-ravaged section of downtown to build a mall- wrapped- around- city- hall monolithic building that's struggled to keep shoppers and tenants. Personally, I prefer how the Comstock looked to the ultramodern styles of the buildings built in its place. Poor lad -- broken a thumb at such a young age, then made to get all dressed up for family. He does appear to have a brace (the black in his palm), which would indicate a pretty serious break, and the lack of our ultra-modern materials means it looks a lot worse than if you broke it today. These days, we have flesh-colored or transparent high-strength tape and carbon-fiber braces that make it all but invisible. 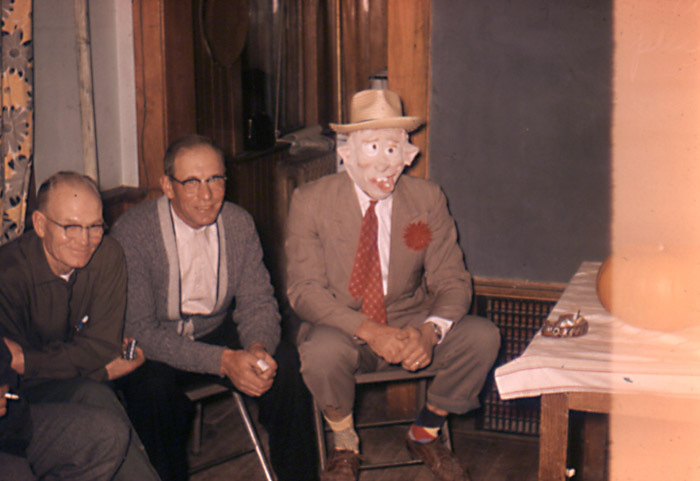 In the thirties, they had cloth tape -- or that might even be a plaster cast. Also, remember this farm was probably a good 5 to 10 miles from the nearest town...if they went to a doctor at all. If a neighbor or even dad was handy with medical supplies, the only doctor consulted was a copy of the Modern Home Medical Advisor that came free with $10 of groceries down at the Red Owl. From this collection. 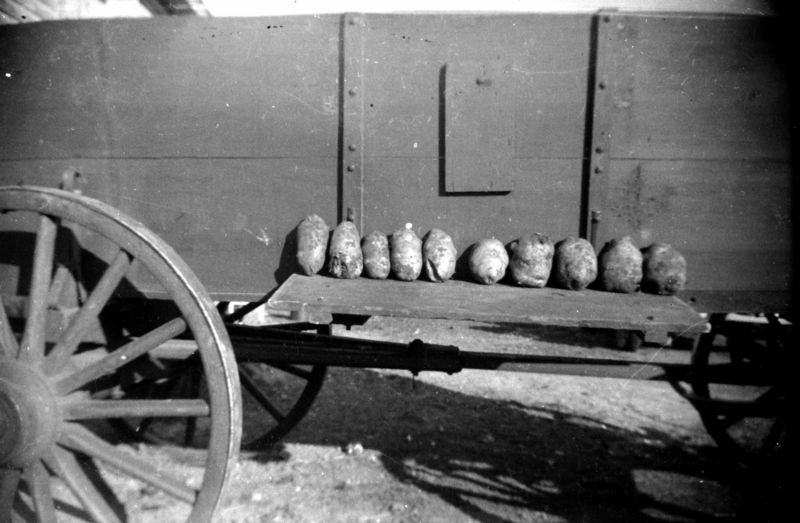 Potatoes. What more can I say? This photo was taken, looking west, down Center Avenue in Moorhead Minnesota, in 1961. These floats, all from 4Hers around Clay County, were on their way to the 4H Roundup in town. Much of what's seen here is still around, despite the flurry of Urban Renewal a few years later (most of that happened just off to the right of the photo) -- in the distance, that tall sign is the FM Hotel, now an office building; the sign now has the US Bank logo. That building in the foreground, with the Anderson Pontiac sign, and the building next to it, are still around, but I'm not sure what's occupying them now. 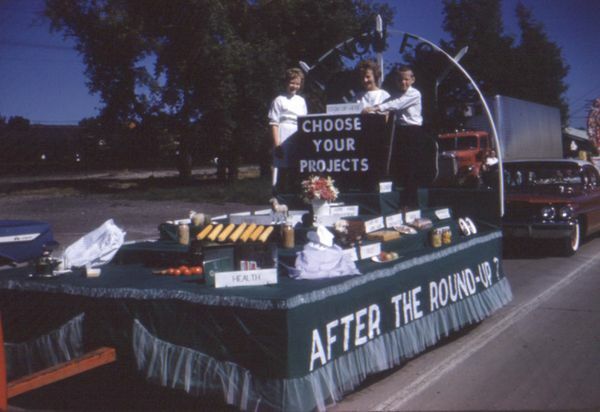 In the summer of 1961, 4H-ers from all over Clay County, Minnesota, converged on Moorhead for a parade and a Round-Up. Not exactly the County Fair (that's held in Barnesville), it was a chance for local farm kids to head into the big city and show off their skills. These photos were taken along Center Avenue, standing in front of what's now a vacant car dealership just east of 9th Avenue. The photos focus on the floats -- sadly, very backlit -- but there's a few photos from the Round-Up. 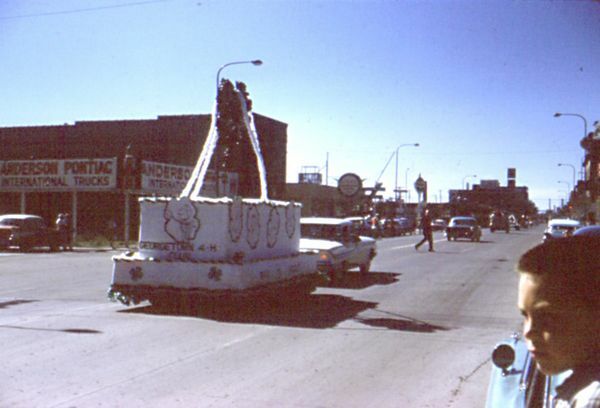 I do not know the photographer; the focus given to the Oak Mount float would lead me to believe that the family is from Kragnes, a few miles up the road from Moorhead (although in the past 50 years Moorhead has encroached close to Kragnes' borders; if I were a mall developer, that's where I'd buy land). My dad was in 4H a few years later. At 6 years old he was still a bit young for this parade; these kids would be in their 60s today. Unfortunately for Mr. Baxter, he's got too common a name for me to reliably track him down. Most photos are from the Winona, Minnesota area, so I'm fairly certain Charles hails from there. 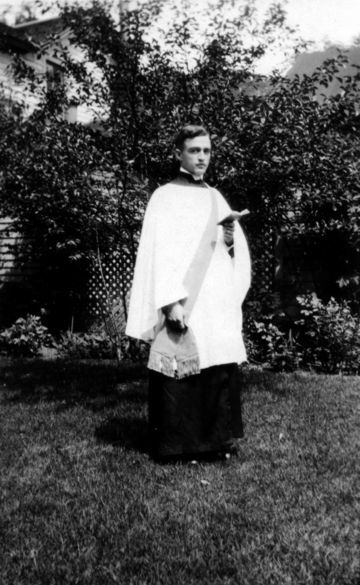 This photo of Charles, in his vestments, was taken in 1916 (as was one of him out of vestments), so my guess is he was born in the 1890s -- he's probably not around anymore, sadly. The back of the photo indicates he's wearing his "vestments", consisting of an unadorned white chasuble over a black alb or cassock, with a light-colored fringed stole with the Cross Pattée embroidered at the ends. Having the stole draped to the side would indicate that Charles hasn't completed his ordination yet -- it's worn symmetrically by ordained priests & ministers usually. His book is rather thin, and is probably a prayer-book. Vestments are similar between the various Christian lines, so I can't decisively identify his church. Still, I hope he continued his education, and got his stole moved to the center. The idea that a tornado could take the roof clean off sounds like an exaggeration -- but there's ample evidence that's exactly what happened here. These photos were from the 1950s at the latest -- 1920s at the earliest -- all of which are on the early side when it comes to rural infrastructure in this part of the world. Put yourself in this farm family's shoes: It's raining like hell, you've got no TV, no telephone, no radio (and even if you did, there was no 'emergency broadcast system', no NOAA weather radio, and even a little rain interferes with them all), you're huddled around a candle in your dirt cellar, and you hear the rumbling -- like a train, but the nearest tracks are 10 miles away. You've got nothing you can do but wait it out, and hope it doesn't come too close of the house. They're lucky it was just the top of the barn -- as you can see in the last photo, they were able to put things back together, hopefully without too much loss. 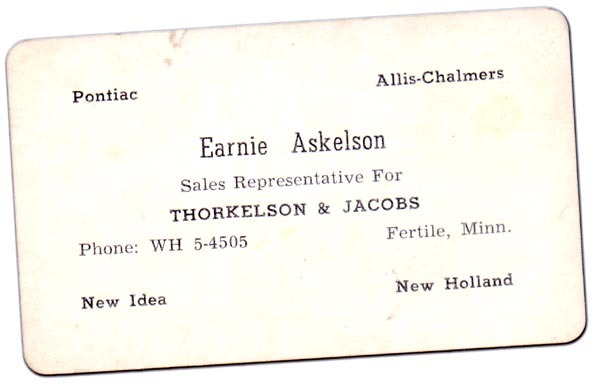 Earnie Askelson lived in the small city of Fertile, MN, one of the larger stops between Fargo and Grand Forks along US 75. 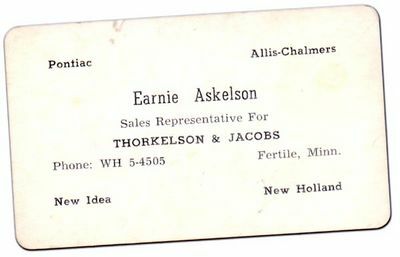 During the 1950s, Thorkelson & Jacobs was an implement dealer, catering to the huge farming community in the region. As you might notice, firm lines weren't drawn between the types of machines with engines: cars were sold along with the plows and harvesters. For a small town, I'll bet this helped against spreading the expert mechanics too thin between dealerships. Thorkelson & Jacobs no longer exists --if you're looking for a Pontiac, Christian Motors is the GMC dealership in Fertile now. Sing along with me: "One of these things is not like the other; one of these things is not quite the same..." I really hope this photo was taken around Halloween, otherwise Gunther has got some 'splaining to do. If you look closely, he didn't just grab some kid's mask and put it on for the photo: he's got mismatched ugly socks, an over-the-top boutonniere (matching his tie, no less! ), all wrapped in an ill-fitting suit. Gunther was probably quite disappointed when nobody else wore their costumes to the party, coincidentally held on Halloween though no costuming was ever mentioned. He's still wearing the costume to try and remain inconspicuous, as though he just casually stopped by in whatever he had on that day. Poor, poor Gunther.